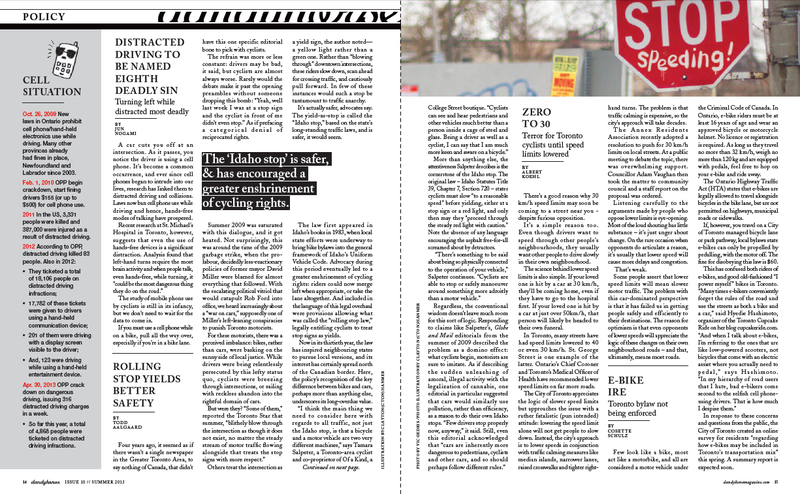 "The 'Idaho stop' is safer and has encouraged a greater enshrinement of cycling rights." Four years ago, it seemed as if there wasn’t a single newspaper in the Greater Toronto Area, to say nothing of Canada, that didn’t have this one specific editorial bone to pick with cyclists. The refrain was more or less constant: drivers may be bad, it said, but cyclists are almost always worse. Rarely would the debate make it past the opening preambles without someone dropping this bomb: “Yeah, well last week I was at a stop sign and the cyclist in front of me didn’t even stop.” As if prefacing a categorical denial of reciprocated rights. Summer 2009 was saturated with this dialogue, and it got heated. Not surprisingly, this was around the time of the 2009 garbage strike, when the pro-labour, decidedly less-reactionary policies of former mayor David Miller were blamed for almost everything that followed. With the escalating political vitriol that would catapult Rob Ford into office, we heard increasingly about a “war on cars,” supposedly one of Miller’s left-leaning conspiracies to punish Toronto motorists. For these motorists, there was a perceived imbalance: bikes, rather than cars, were basking on the sunny side of local justice. While drivers were being relentlessly persecuted by this lefty status quo, cyclists were breezing through intersections, or sailing with reckless abandon into the rightful domain of cars. But were they? “Some of them,” reported the Toronto Star that summer, “blithely blow through the intersection as though it does not exist, no matter the steady stream of motor traffic flowing alongside that treats the stop signs with more respect.” Others treat the intersection as a yield sign, the author noted— a yellow light rather than a green one. Rather than “blowing through” downtown intersections, these riders slow down, scan ahead for crossing traffic, and cautiously pull forward. In few of these instances would such a stop be tantamount to traffic anarchy. It’s actually safer, advocates say. The yield-as-stop is called the “Idaho stop,” based on the state’s long-standing traffic laws, and is safer, it would seem. The law first appeared in Idaho’s books in 1983, when local state efforts were underway to bring bike bylaws into the general framework of Idaho’s Uniform Vehicle Code. Advocacy during this period eventually led to a greater enshrinement of cycling rights: riders could now merge left when appropriate, or take the lane altogether. 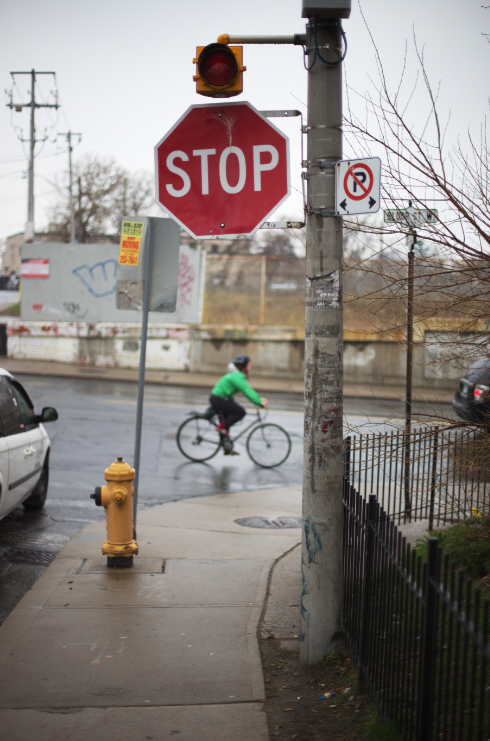 And included in the language of this legal overhaul were provisions allowing what was called the “rolling stop law,” legally entitling cyclists to treat stop signs as yields. Now in its thirtieth year, the law has inspired neighbouring states to pursue local versions, and its interest has certainly spread north of the Canadian border. Here, the policy’s recognition of the key difference between bikes and cars, perhaps more than anything else, underscores its long-overdue value. “I think the main thing we need to consider here with regards to all traffic, not just the Idaho stop, is that a bicycle and a motor vehicle are two very different machines,” says Tamara Salpeter, a Toronto-area cyclist and co-proprietor of Of a Kind, a College Street boutique. “Cyclists can see and hear pedestrians and other vehicles much better than a person inside a cage of steel and glass. Being a driver as well as a cyclist, I can say that I am much more keen and aware on a bicycle.” More than anything else, the attentiveness Salpeter describes is the cornerstone of the Idaho stop. The original law – Idaho Statutes Title 39, Chapter 7, Section 720 – states cyclists must slow “to a reasonable speed” before yielding, either at a stop sign or a red light, and only then may they “proceed through the steady red light with caution.” Note the absence of any language encouraging the asphalt free-for-all screamed about by detractors. dandyhorse issue #10 is here!